Frustrated by my ability to correctly complete a project in the last few months, I decided to take on something more straightforward. This is Francisca*. Jason and I are going to a wedding on Nantucket next weekend, and I think it will be perfect to throw on when it gets chilly. This was my first poncho, and I can assure you that it won't be my last! I just love it. By the way, the name of my daughter is Franciska, so I'll make one for her. What a perfect present! Wow, it looks awesome on you! I swear that in my two days shopping in NYC, we must have seen about 50 of those lacy ponchos. They couldn't be more in. Yours looks great, especially that color. Woohoo an FO! Sandra -- that sounds like a terrific idea! I don't know how old your daughter is, but there's really, truly nothing cuter than a little girl in a poncho. Alison -- thanks! It's so exciting to have an FO that I *like*. 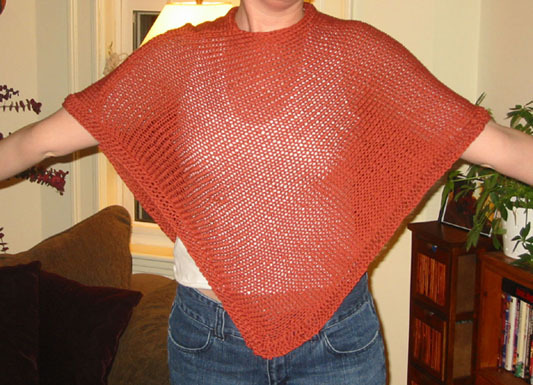 I may knit ponchos exclusively from now on!